Standard which is used for monitoring documents and providing a drill down view of all of your documents, counts, and Gross Merchandise Value (GMV). 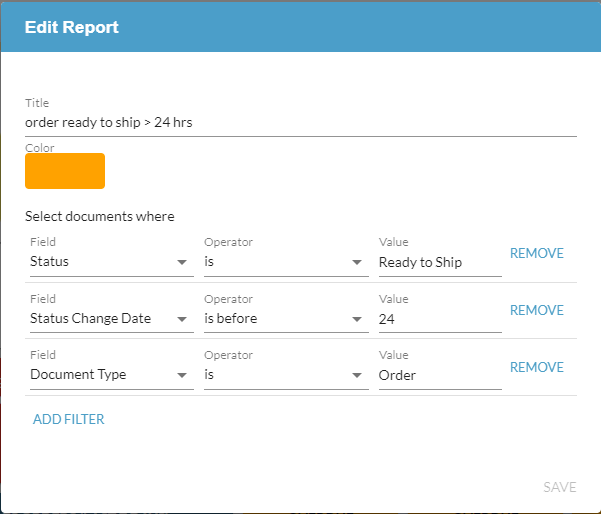 Reports and charts can be filtered, moved and resized according to your preferences. Advanced which provides full business intelligence tools for analyzing your data. This includes vendor compliance reporting, year-over-year (YoY) comparisons, and extending Logicbroker Data with other data sources. To learn more about Advanced Reporting, see this article or contact us. By default you will be provided a set of charts and reports. This includes an order count bar chart, GMV donut, and a list of common counts for monitoring your data. 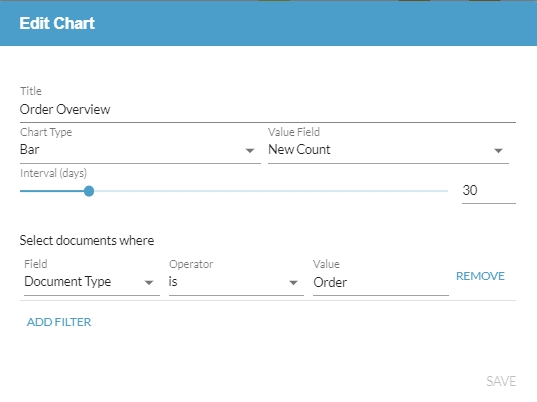 You can edit the default or create your own new reports and charts. To do that continue below. If you need to restore your default configuration, you can always click the Reset to Default button. Report tiles are used to show a count of your documents based on filtered conditions. To create a new tile click "New Report" and begin by adding a title. The title will show up on the tile with its corresponding document count. Available options include Order, Acknowledgement, Shipment, Invoice and Return. This is the status description; all available options can be found here. Typical order statuses include Ready to Acknowledge, Ready to Ship, Ready to Invoice, and Complete. This is the code associated with the status; all codes can be found here.Typical order status codes 150 (Ready to Acknowledge), 500 (Ready to Ship), 600 (Ready to Invoice). This is the sender Company ID. Your partner's Company ID can be found by navigating to the Suppliers or Retailers page. This is the receiver's Company ID. Your partner's Company ID can be found by navigating to the Suppliers or Retailers page. Date the status was last changed for that document. System of how the document was received. This includes Portal, Workflow, CustomXML, CSV, External API, EDI, and other system names. For a list of all systems see our Channel and System Integrations section. You can add as many filters as you want and all filters conditions use an "AND" condition; therefore the documents in the report will only count if they meet all the conditions setup. When a tile is added to your reporting dashboard, you can filter, delete, copy, edit or download a CSV/XLSX export of all the documents counted in the report. In addition, if you click the number you will be taken to a filtered page with a list of all the documents. After adding your tiles you can always re-shape move and organize your dashboard to provide a monitoring view that fits your needs. 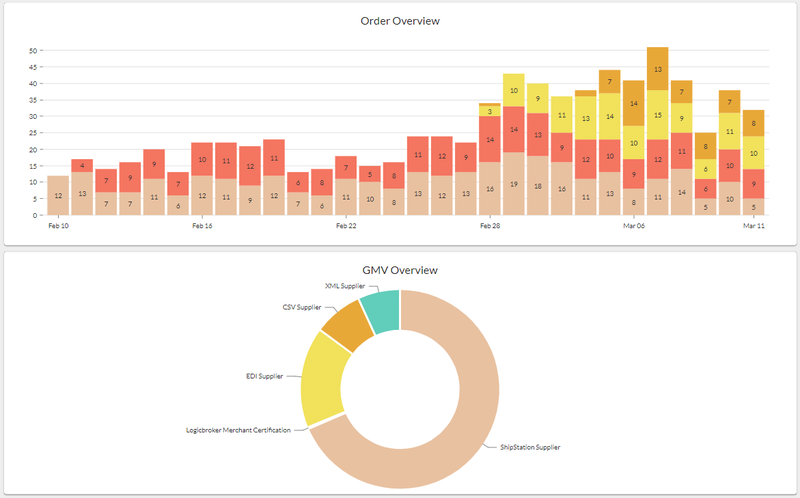 Charts allow you to create a view of your order counts, quantity and GMV totals. You can create a Line, Bar, or Pie chart for your data and set a time interval to provide a visual picture of your data. To create a new chart click "New Chart" and add a title. # of documents that have been received based on the time interval set. # of documents that have failed based on the time interval set. # of documents completed based on the time interval set. That is documents that have been full shipped and/or invoiced. # of documents that have been marked as duplicate in the time interval set. Aggregated Invoice total $ amount provided on all invoices given the interval set. Aggregated (Quantity * Price) for all line items provided on your orders given the interval set. Aggregated Quantity for all orders given the interval set. A Document Type should always be provided. If no sender or receiver filter is added the visual will automatically break out the data per partner. Like tiles, all charts can be edited, deleted, copied, and resized. All reports created are saved on the user level; this means the reports you create are notvisible across your company's account. However, you can share your reports to your colleagues by exporting your report configuration and having them import it. Use the Export Configuration to save the file and when logged in as a different user, use the Import Configuration to import that same file.